Professional Development from THE Guided Reading EXPERT! I felt giddy, and star struck, and oh so excited! This was a great day!! 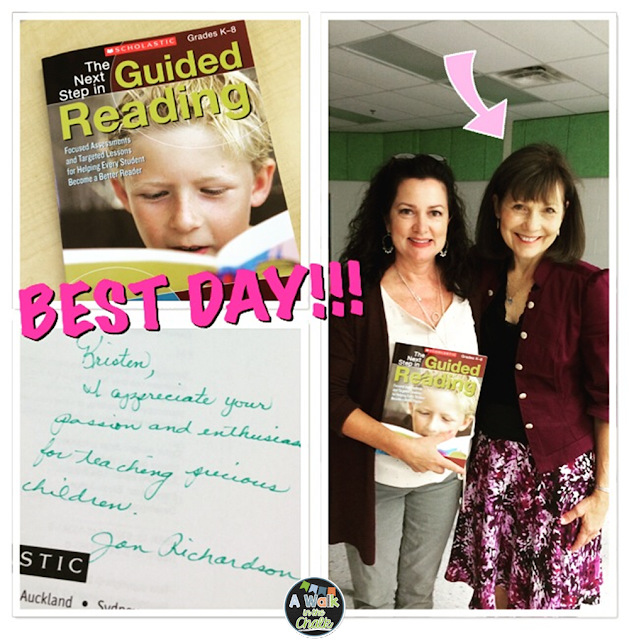 I recently had the pleasure of attending a professional development workshop with THE Jan Richardson...how lucky am I?!?! OK...I can admit it... I LOVE Jan Richardson! As an ESOL specialist, I spend most of my school day doing guided reading lessons with my students; and I have been a LONG time admirer of her work. I thought I'd share with you some of the highlights from my session, and a few of my "take aways." First off, how did this even come to be?! They say, it's all in who you know, right? Well, I lucked out BIG TIME because my assistant principle was a student of Jan Richardson back in 8th grade. Can you imagine having J.R. as your English teacher?!? !...so cool. My AP contacted Jan and asked if she'd be willing to come to our school to give some professional development. And she did! We got word that each grade level team could only send one member to the workshop. There was a K-1 session, grades 2-3 and a grades 4-6 session. Of course I BEGGED my team to let me go, and they thankfully agreed...I love them! I attended the grades 4-6 session. I must admit, when I saw her I was a bit giddy! "stay calm...keep your cool." I can't help it, I LOVE her! What I noticed about her, right away, was that when she talks to you, she gives you 100% of her undivided attention. She looks you straight in the eye and really connects with you. I noticed this when she worked with the students as well. After she spoke with us about guided reading, a group of 4th and 5th graders came in and Jan modeled a guided reading lesson for us. We took notes, and then were able to reflect on what we observed afterwards. The kids were great! Can you imagine walking in and having about 10 grown-ups sitting in a semi circle around the guided reading table, watching. They looked nervous, but boy were they troopers:) One of my students was in the bunch, and I couldn't be more proud of him. 1 - Set a clear purpose! 3- Set a timer! This really keeps her lesson moving along. I am definitely giving this a try. I have 10 guided reading groups this year, and I can EASILY get behind by a few minutes with one group, which inevitably throws off my timing with my remaining groups. 5- Incorporate guided writing into the lesson. 6-Ask whole group questions to elicit discussion. She fit in a whole heck of a LOT of skills into one guided reading lesson...wow! To students - "Let me teach you something that'll make you a better reader." To us - "Zone in - hit the target - and get out." Retell is the foundation of reading comprehension. The power of guided reading is the prompting. This was truly a highlight for me that I will not soon forget. I am a big fan of Jan Richardson's and believe she has had an integral part in me becoming the teacher that I am and that I strive to be. I am currently re-reading her book, The Next Step in Guided Reading. My main goals this year are to use a timer, and to incorporate more guided writing into each lesson. Now that's the kind of PD that I am all for! !